Learn how to make Pad Thai and impress your friends with your taste of Thailand culture. Below is a cooking video to show you how to make the Pad Thai. 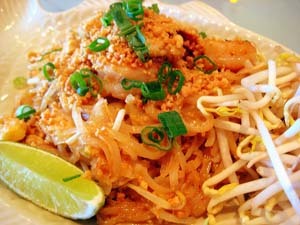 The famous Siamese meal called Pad Thai - Thai style fried noodles. Besides the fact that there are many different combinations and items to put in this dish - there are 3 other things you must know. Pad Thai is one of the most challenging dishes to make. Most people who try to make it for the first time realize how only a certain combination will make it taste the way it's supposed to. So if at first you have a hard time with it don't be surprised. Your friends will have tasted this before. Not this is a bad thing. What you must understand is that your friends will have an idea of how it's "supposed" to taste. That means that they'll know right away whether or not you did a good job of it. Rest easy - I'm sure they won't say anything. Chances are that they'll be impressed that you've tried to cook it! You'll need a lot of ingredients. In fact some of the ingredients might be missing. If that's the case you'll have to try without them. Not only that but some of these ingredients (Tamarind sauce or tofu for example) you won't need for anything else. It's something to keep in mind as you make this dish.